This afternoon I gave our governor some data and asked him to do a favor similar to what Sam Gejdenson pulled off back when I was about 17 years old. 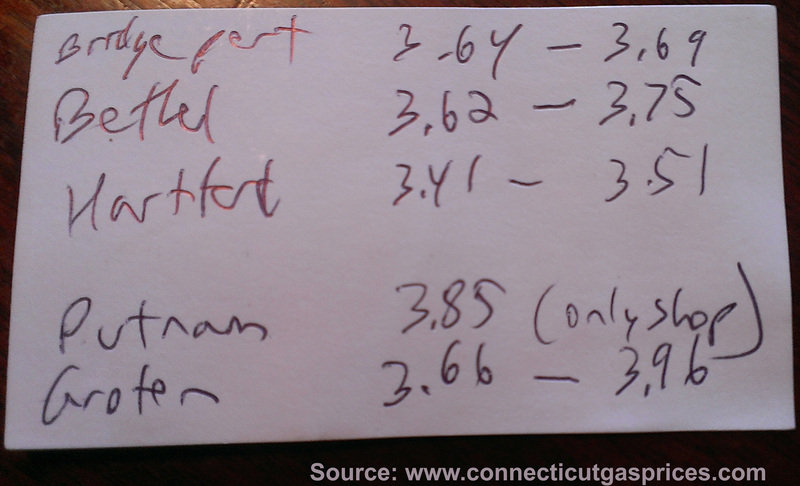 He had managed to catch lots of gas gouging that caused southeastern CT to be the lowest wages and highest gas prices. Prices went down to something managable but crept back up little by little to where it is now once again New London County having some of the lowest wages in the state but the highest gas prices. I was telecommuting in Muddy Waters eating one of their famous Love Salads when the Mayor, Governor and many other democrat cronies walked in to do some schmoozing at this the third of three local coffeehouse stops including BeanLeaf and Washington Street Cafe. I wasn’t prepared to speak with him but I remembered this issue historically and would love to pose this question of everyone from him to Richard Blumenthal to Joe Courtney. And no, not just because they’re democrats. Mostly because it hurts. 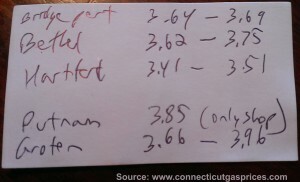 Well the Governor begged to differ and said he thought Fairfield’s prices were 10 or 20 cents higher, and I sought compromise saying then that maybe Groton, NL, Wtfd have the lowest wages and the second highest gas prices in the state and he agreed to look into it. So while he was schmoozing with everyone I buried myself back in my laptop and went right to one of those gasprices dot com sites to get him some data. Jotted them down on the back of a biz card and handed it off to one of his staffers asking him to get that data to him whenever things are less pressing. He obliged. This was written by admin. Posted on Monday, August 18, 2014, at 1:22 pm. Filed under Mundane Or Sublime, News, OpEd, Tech. Bookmark the permalink. Follow comments here with the RSS feed. Both comments and trackbacks are currently closed.